Android 9 Pie, the next iteration in the Android family, has now been officially released. The latest Android version comes after the debut of five developer preview builds of Android P that are claimed to have been tested by more than 140,000 beta testers till date. Google also earlier this year announced its partnership with seven OEMs (original equipment manufacturers) to bring the beta releases of Android Pie to their flagship devices. However, the new software package, which was previously speculated to debut as Pistachio Ice Cream, isn't designed for Nexus models, including the Nexus 5X, Nexus 6P, and Pixel C. This doesn't mean that the search giant isn't favouring its native hardware altogether. The fresh experience through Android Pie is certainly arriving first on Pixel handsets, including the original Pixel and Pixel XL as well as the Pixel 2 and Pixel 2 XL. 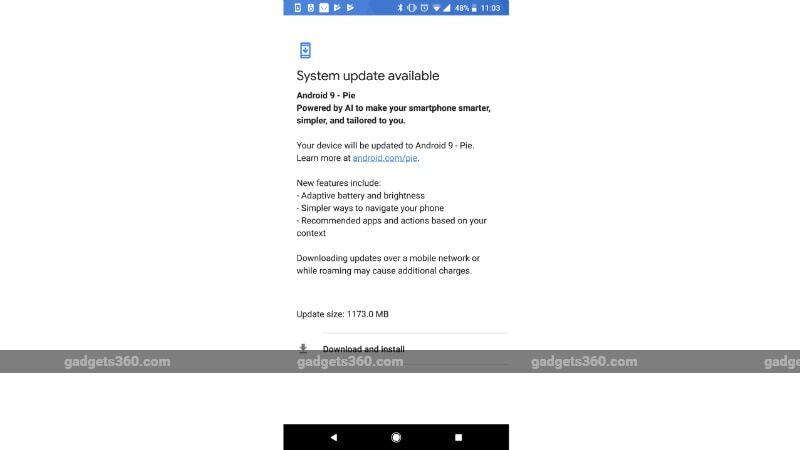 The new Android 9 Pie platform, the successor to Android Oreo, has various improvements over the previous Android versions, but the most notable one is the gesture-based navigation system. This is highly inspired by the way the interface featured on the iPhone X last year and omits the traditional three-button navigation. As we mentioned, Android 9 Pie is initially rolling out to Pixel devices, including the Pixel, Pixel XL, Pixel 2, and Pixel 2 XL. The update is already live as an over-the-air (OTA) package, and you can manually check its presence on your Pixel device by going to Settings > Software updates. Google has additionally announced that companies participated in the Beta programme, namely Essential, HMD Global, OnePlus, Oppo, Sony, Vivo, and Xiaomi, will receive the update by the end of this fall. Notably, the Essential PH-1 has already been issued its update. Similarly, devices that are available under the Android One initiative will receive the update sometime around its rollout for the devices listed under the Beta programme. These include Essential PH-1, Nokia 7 Plus, OnePlus 6, Oppo R15 Pro, Sony Xperia XZ2, Vivo X21, Vivo X21 UD, and Xiaomi Mi Mix 2S. The company led by Sundar Pichai is also working with a number of OEMs to bring Android 9 to their devices later this year. 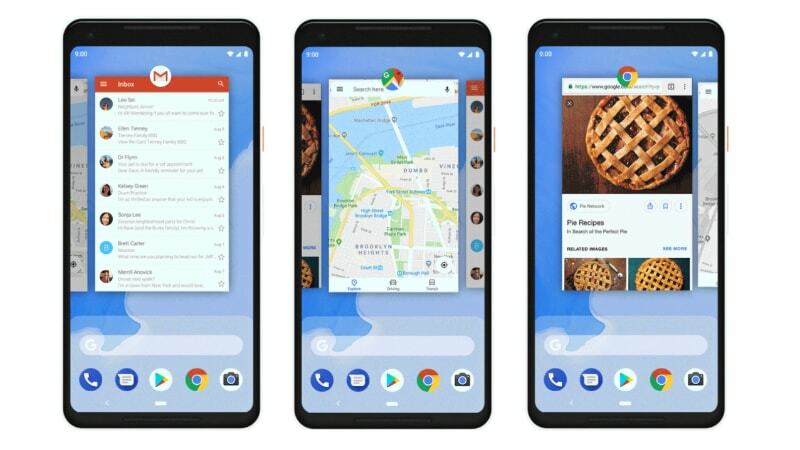 Among other great features, Android 9 Pie brings a new system navigation that operates using a single home button - similar to how the iPhone X works. You can swipe up the home button to get into the Overview and view full-screen previews of your recently used apps. There is also an enhanced Smart Text Selection feature that works recognises the meaning of the text you've selected to suggest your relevant actions such as opening Google Maps to see the reviews of a place or open Gmail to write an email. You can also swipe to switch between multiple apps. Additionally, you can press and hold the tiny home button to activate Google Assistant. The new navigation system replaces the bar available at the bottom with three buttons for back, home, and overview. 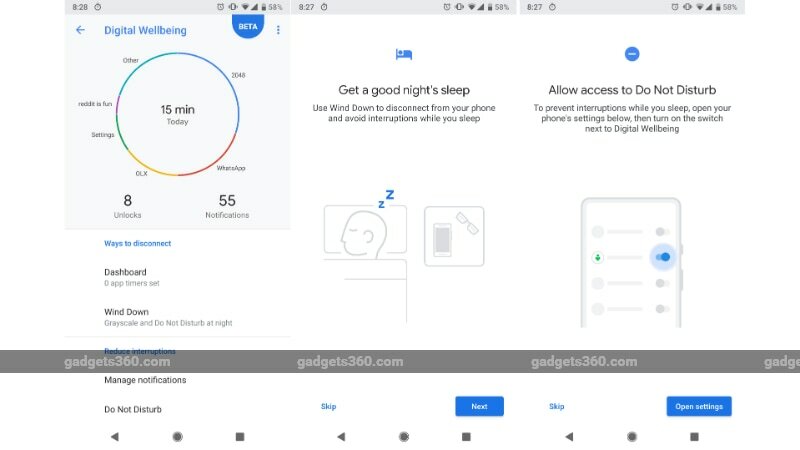 In addition to the new navigation system, Android Pie has various machine learning inputs to enable features such as Adaptive Battery and Adaptive Brightness. Both features offer a personalised experience. Further, there is an App Actions feature that predicts what you'll want to do next based on your context and display that action right on your device. For instance, if you usually use Google Maps to navigate to work, the feature enables your device to automatically show you Google Maps navigation option when you're preparing to commute to your work. The new Android version also includes an upgraded Do Not Disturb mode that allows you to turn off all visual interruptions. Security in Android P is also touted to be largely improved over Android Oreo. There is an improved security model for biometrics as well as privacy improvements such as TLS by default and DNS over TLS to protect web communications. At I/O 2018 in May, Google announced its Digital Wellbeing initiative that helps you make the better use of your device. The initiative includes a new Dashboard to show the time you spend on your device, an App Timer to help you set time limits on particular apps and gray out the icon on your home screen when the time is up, and Wind Down to switch on the Night Light and Do Not Disturb mode alongside fading the screen to grayscale before your bedtime. These features aren't debuting alongside the Android Pie update on your Pixel device. Google says that the Digital Wellbeing package will be available on Pixel phones this fall, though it will reach Android One and other devices later this year. Nevertheless, you can sign up for the beta with the email address you use with Google Play. Once you've accepted the invitation after signing up, Digital Wellbeing features will appear in the Settings menu of your handset. It is worth noting here that similar to Google's attempt, Apple is also considering digital wellness as one of the key aspects in designing its next iOS version and incorporating tools to help users monitor how much time they spend on their devices and on certain apps. The beta versions of iOS 12 already offer a glimpse of the tools that are likely to reach the masses sometime in September. Google also announced App Slices at I/O 2018 that are designed to highlight rich, dynamic content from apps directly in the search bar and in places such as Google Assistant. However, similar to Digital Wellbeing, this has been kept for future. Google is apparently waiting for third-party app developers to implement certain changes to enable the slices functionality on their apps. Apart from the major new features, Android P brings enhanced messaging notifications that include conversations, photos, stickers, and smart reply options. Text selection has also been improved with a Magnifier widget that helps users precisely position the cursor or the text selection handles by viewing zoomed text through the draggable pane. Display cutout is also a part of Android Pie to support notches.